The National Financial Supervisory Commission (NFSC) has released a report on Vietnam’s economic situation in the first seven months of 2015, which also includes information on first-half results. GDP in the first six months reached 6.28 per cent compared with the same period of 2014 and is on a trajectory towards recovery. The NFSC therefore predicts GDP in the first nine months of this year will be 6.4 per cent and 6.5 per cent for the year as a whole. Manufacturing has contributed significantly to GDP, as the Index of Industrial Production (IIP) is estimated to have increased 9.9 per cent over the same period last year. In the first seven months total export turnover was estimated at $92.3 billion, an increase of 16.4 per cent year-on-year, with the trade deficit estimated at $3.4 billion, accounting for 3.6 per cent of total export turnover (a 1.2 percentage point decline against the first six months of 2015). In the first six months Vietnam recorded a trade deficit of an estimated $3.7 billion, of which the foreign direct investment (FDI) sector recorded a surplus of $6.1 billion and local enterprises a trade deficit of $9.8 billion. Export turnover growth in the first half was 9.3 per cent, significantly lower than the 15.4 per cent recorded in the same period last year. The NFSC said that factors behind the lower growth include the price of crude oil falling 47.6 per cent, natural rubber falling 22.4 per cent, and rice falling 4.7 per cent. Growth of imports in the first six months was 17.7 per cent, higher than the 10.5 per cent recorded in the first half of 2014. The NFSC said that, excluding price factors, export turnover in the first half was estimated at $84.6 billion, an increase of 22.1 per cent over same period last year. It concluded that import turnover increased sharply due the economic structure being highly dependent upon importing machinery and resources as well as the falling crude oil price. The average CPI in Vietnam was around 8.6 per cent higher than in the same period last year. Average core inflation for the first seven month was about 2.42 per cent, remaining at around the same level for the last five months. The NFSC expects to see core inflation in 2015 of about 3 per cent. Foreign exchange markets remained stable in the first seven months, as the USD/VND rate was in the range of VND21,805 – 21,815 per USD. The reason for the stability was the State Bank of Vietnam (SBV) making steady moves in terms of managing monetary policy, as the price of USD sold to the market, of VND21,820, was within a stable range. 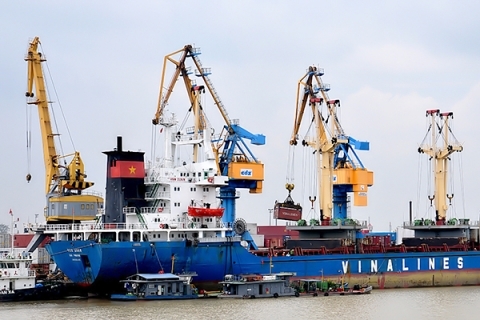 Secondly, according to the General Department of Vietnam Customs, there were positive signs in the balance of trade in the second half of June, with a June trade deficit of $140 million, lower than the estimated $700 million. Thirdly, foreign currency remittances in the first half were estimated at $13-$14 billion, while FDI disbursement in the period reached $6.3 billion, an increase of 9.6 per cent against the first half of last year. The NFSC said that liquidity in the financial sector was stable, as the Loan to Deposit (LDR) ratio increased slightly from 83.3 per cent in 2014 to 84.7 per cent by May 2015.
Business results of financial institutions were relatively good, with credit growth standing at 7.32 per cent as at July 20 compared to the end of 2014 and net profits increasing 14.91 per cent, meaning institutions must set more aside for risk provision. Finally, the non-performing loan ratio fell from 3.81 per cent in March to 3.15 per cent in May, with the SBV expecting it to be less than 3 per cent by October.